In this animated series, an unlikely hero tries to save the universe. Steven is a half-human, half-magical being who boasts superpowers that emanate from his bellybutton. He's also a bit of a bumbler, making the universe-saving job a bit more difficult. The series debuted on Cartoon Network in 2013 and, as of 2018, was airing its fifth season. Steven travels to visit his family. Episode 10 - What's Your Problem? Steven confronts Pearl about the shattering of Pink Diamond, but instead has to venture inside of Pearl's gem to retrieve her cell phone. While in there, Steven discovers the shocking truth about Rose Quartz and the secret she Pearl swore to keep many years ago. Lars receives a letter from Steven updating him about the current goings-on in Beach City. While the town and its population are changing, the now-former mayor Bill Dewey is having trouble trying to find his place in the new status quo. Garnet spends a day trying to behave unpredictably, attempting to train her future vision to account for the unexpected. When she and Steven eventually discover some homeless kittens, Garnet admits how lost and stressed she feels when she doesn't know what the future holds. In this documentary-style episode, Steven records the rise of Sadie's new band, Sadie Killer and the Suspects. The band hires Greg as their manager, who hooks them up with producer Sunshine Justice (voiced by Joan Jett). Complications arise, however, when Sadie worries about her mother getting in the way. Your Mother and Mine: Steven takes Garnet to meet some of his new friends. / The Big Show: Steven shoots a documentary that follows a local band as they get their first big break. Lars of the Stars: Lars rises to the occasion. / Jungle Moon: Stevonnie finds themself alone on an adventure. Sadie Killer: Steven and the Cool Kids start a band, but they have trouble finding their sound. / Kevin Party: Kevin is throwing a party, and Steven is invited. Raising the Barn: Pumpkin goes missing! / Back to the Kindergarten: Steven, Amethyst and Peridot try to spruce up the Kindergarten. Steven finally gets to know the real Lars. Steven goes to court against Blue and Yellow Diamond to determine his (or rather Rose Quartz's) fate. Steven writes letters to Lars about all the latest news in Beach City. Steven and Garnet explore the most unlikely timelines in Beach City. Steven takes Garnet to meet his new friends. Episode 9 - Are You My Dad? When Lion coughs up a magical key, Steven goes on a quest to discover what it unlocks. Tiger Philanthropist: Steven returns to the ring to continue his pro wrestling odyssey. / Room for Ruby: Steven's Gem family continues to grow. When Amethyst quits wrestling at the abandoned warehouse, Steven continues doing so himself as Tiger Philanthropist. However, Steven soon begins to doubt the point of wrestling when the audience doesn't take to his new persona. Storm in the Room: Steven goes into his room in the temple to look for answers. / Rocknaldo: Ronaldo sets out to find all the rock people living in Beach City! That Will Be All: Steven and the Gems make a daring escape! / The New Crystal Gems: Connie helps look after Beach City while Steven is busy. Gem Heist: The Gems try to pull of a heist. / The Zoo: Steven visits a special zoo. 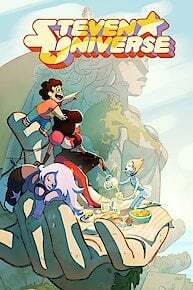 Steven Universe is currently available to watch free on Cartoon Network and stream on Cartoon Network. You can also stream, download, buy, rent Steven Universe on demand at Amazon, Hulu, Vudu, Google Play, DIRECTV NOW, iTunes online.